Gregg Shienbaum Fine Art specializes in contemporary art. With over 20 years of experience, owner Gregg Shienbaum, formally of Verve Gallery, brings his expertise in the field of contemporary art to Wynwood Arts District, in Miami, Florida. 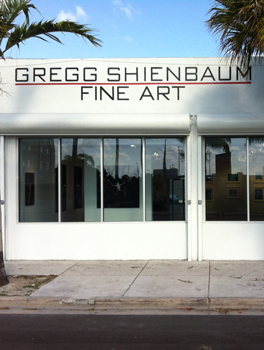 Gregg Shienbaum Fine Art, is incomparable to most other galleries in South Florida. The gallery features works of art in various media, with a special emphasis on contemporary prints and multiples. Our inventory consists of artworks by such artists as Andy Warhol, Roy Lichtenstein, Tom Wesselmann, Robert Rauschenberg, Jasper Johns, Chuck Close, Jim Dine, Robert Indiana, and many other contemporary masters. The gallery has recently added new emerging artists (both well known, and artist’s in the making) into our repertoire of contemporary artists. In taking on this new project, we have also established a publishing company, which focuses on the teaching and funding of printmaking to emerging artists. Gregg Shienbaum Fine Art aims to provide a wide range of services to our clients in the building and management of their art collection. The gallery caters to both the established, as well as the beginning collector, interested in investment quality contemporary art. We not only advise collectors, but also corporations on acquisitions, and also specialize in the resale of select works of art. The gallery is always interested in purchasing fine prints, paintings, drawings and sculptures consistent with the works on this website. If you wish to sell such works, please contact the gallery.